Bringing the tropics back to their roots with this delicious and refreshing Fruits and Roots Smoothie! As the weather warms up, well not really we briefly hit some nice warm temps but are back to cold and rain, juices, smoothies, and smoothie bowls are back in regular rotation. Don’t get me wrong we love smoothies, smoothie bowls, and juices just they are more of a regular every day thing when the temps warm up. This fresh bright combination is not only delicious but healthy and just hits the spot. 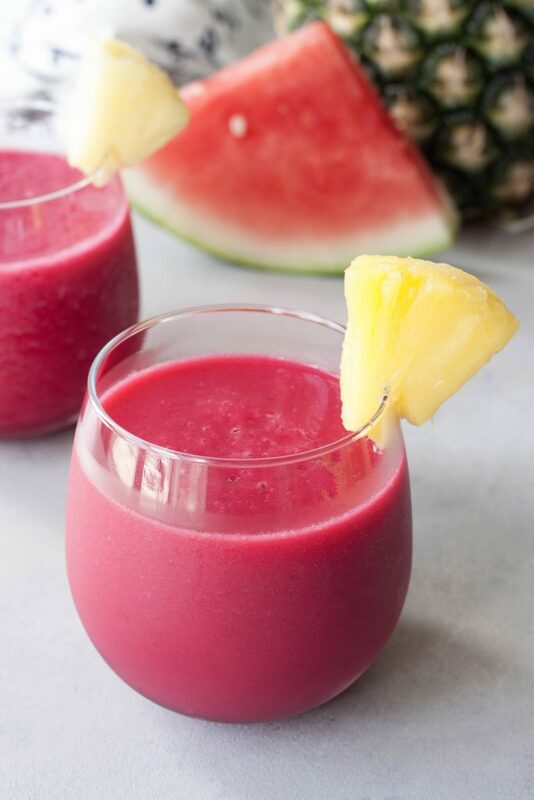 If you’re a regular reader you know I love my beets and they pair so perfectly with watermelon, pineapple, and ginger in this refreshing hydrating combination. With S having some tummy issues watermelon ginger juices have been in regular rotation as they are not only hydrating but great for helping with nausea. Similar to this Watermelon Ginger Refresher I posted a few years ago. Having so much watermelon cut up and it making such a wonderfully hydrating smoothie base this combination has become a favorite for me. It just happens to be a twist on this Pineapple Watermelon Refresher I posted last year. If you’re a fan of watermelon search watermelon on the blog because there are a few others as well. Watermelon also contains L-citrulline, an amino acid, and lycopene, a carotenoid phytonutrient that’s been thought to be good for cardiovascular health. Pineapple has huge health benefits but in this aspect just focusing on reducing inflammation and improving circulation. It’s packed with vitamins and minerals and a great source of soluble and insoluble fiber (improved digestion). Beets are a good source of folate, manganese, potassium, and fiber. They full of antioxidants, which may help to reduce inflammation in the body. Not that I need a reason to eat delicious whole foods like watermelon, pineapple, beets, or ginger. Although after finally having fresh homemade pasta which we haven’t had in a few weeks along with fresh homemade sourdough and wine, sushi, ice cream, and going for brunch yesterday after A’s gymnastics show I’m was ready for all the fresh veggies and fruits again last night. Not that it was an unhealthy weekend or I didn’t enjoy it, it’s just my body really craves and needs the fresh fruits and veggies more and more lately. It’s all about maintaining the healthy happy balance that makes you feel good and that isn’t always the same balance. There is also another delicious way to enjoy this smoothie, and one of my favorites for a nice relaxing afternoon drink or as a mocktail. I like to pour ginger kombucha over the top for a bubbly sippable healthy treat! Really you can’t go wrong with this one either adding in probiotics and other digestive and immune benefits. I’ll probably be enjoying one tonight while enjoying the start of the new The Bachelorette season! 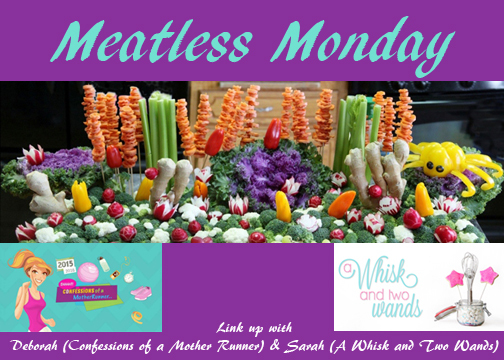 Yes that means it’s Monday so also Meatless Monday! I hope you are inspired by one of the many recipes below and if you have one to share you join my co-host Deborah and me in linking up below. *I like to use frozen pineapple and if possible cold fruit for a frosty cold refreshing drink. **I haven’t tried this with a chopped raw beet yet but will be trying it today if not this week and update the post. 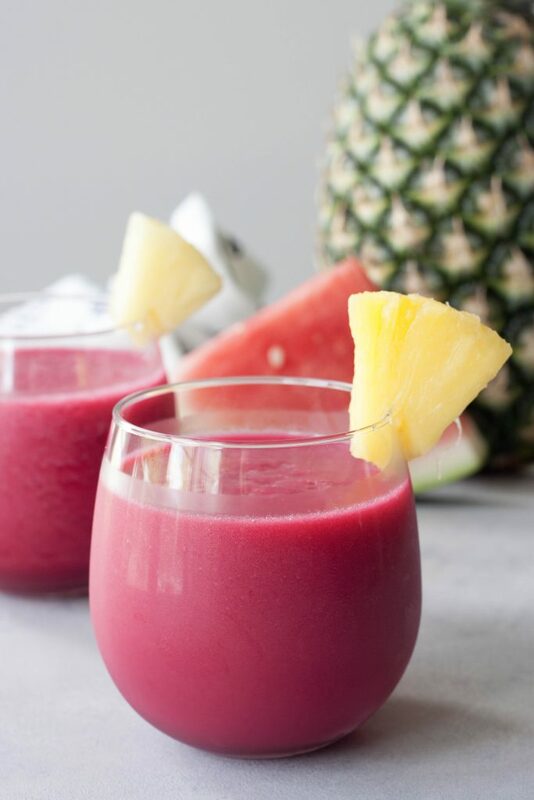 In a Vitamix, or high-speed blender, blend watermelon, pineapple, beet, and ginger together until smooth. 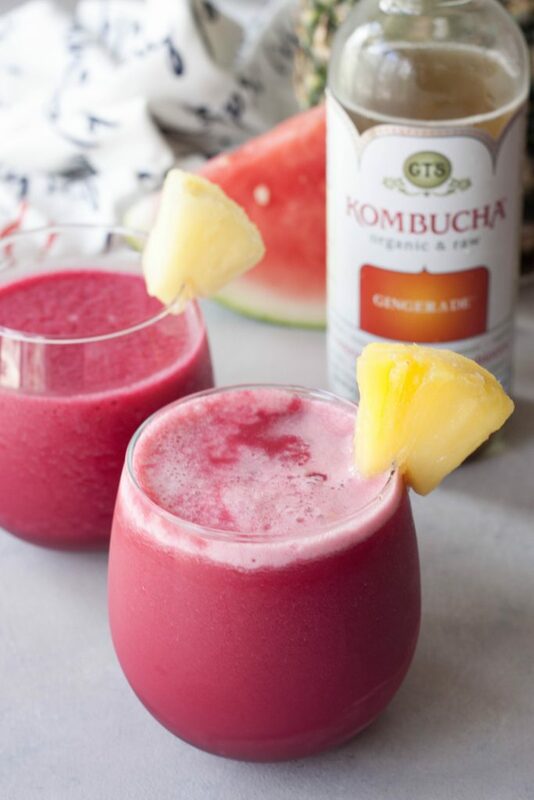 Pour into a glass and enjoy or top with your favorite ginger kombucha! Cheers! Delicious and refreshing Fruits and Roots Smoothie made with only 4 ingredients this healthy smoothie is quick and hits the spot! 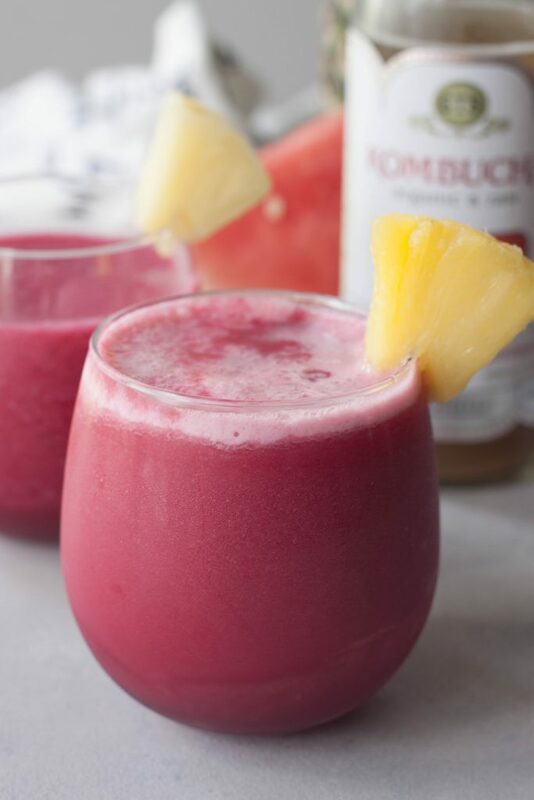 Delicious and refreshing Fruits and Roots Smoothie with kombucha makes a quick healthy mocktail! It really is a delicious refreshing combo! Ugh I need watermelon in my life right now! I love it so much. It’s been so cheap lately here and amazing! The weekend before last I think we went through 3 in a weekend! Wow wow that color!! I love everything in this smoothie…although I’ve never tried kombucha!!! Need to do that! The color is all natural which makes me love it even more! With or without the kombucha it’s delicious but a great reason to try it! Hehe love the name and the color too – this looks so refreshing! Thank you, it really is refreshing and delicious! I can’t wait to try this smoothie! It’s so pretty and the name is so fun too! This is sure to become a favorite around here! It’s so delicious and refreshing I hope you love it as much as I do! Love the name! So clever. Pineapple and watermelon sound like such a refreshing combo! Thank you, it really is a delicious and refreshing combo! Thank you! I had a feeling you’d like it. 😉 It’s so good with the Gingerade too, sipping one right now! This looks so refreshing! I am not a huge kobucha gal, but with the fruit I think I would really love this! It really is! The kombucha is optional, it’s a delicious smoothie without it I just like to add it for a fun healthy mocktail! Oh my Sarah! What a delicious and unique smoothie! Love the color here too. Thanks for hosting!!! Love that gorgeous color! It sounds so refreshing – perfect for summer! Thank you Jenn, it really is refreshing! It really does make it cold and frosty without watering it down. I love smoothies! This one sounds delicious and refreshing! And the color is just gorgeous! Thank you Sonali! It’s so refreshing and delicious I can’t get enough! Beet smoothies are my fave! This one looks uber healthy! I love it! Thank you, I think you’ll love this one!